The Shallows could be easily dismissed as a guilty pleasure if it weren’t so competently constructed and self-serious. Nancy (a believable and shockingly likable Blake Lively) is a med-student at a cross-roads in life wondering if she will or won’t become a doctor? She’s also still emotionally scarred by her mother’s cancer-related death. Therefore, she does some soul-searching in Mexico where she successfully finds a secret cove and beautiful beach where her mother spent some time shortly after learning she was pregnant with Nancy. There she takes to the surf and stays out in the shallow waters just a little bit too long…accidentally stumbling upon one insatiable shark’s feeding spot. In the past Guillermo del Toro has used ghosts as metaphors for fractured relationships (The Devil’s Backbone) and task-master demons as the personifications of the ill effects of civil war and bad parenting (Pan’s Labyrinth), but in Pacific Rim he goes Hollywood and delivers a simple giant monsters vs. giant robots saga. Which….when you think about…in the hands of del Toro…should be totally badass, right? I mean, 180 million dollars to film non-stop monsters vs. robots mayhem? What could go wrong? 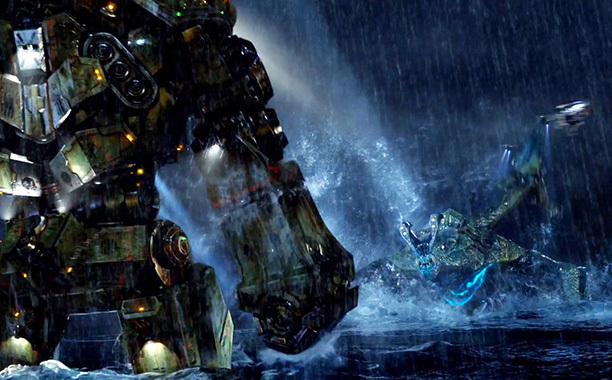 Pacific Rim is by no means a bad flick, in fact, most of it is quite fun. I just couldn’t help feeling underwhelmed considering the can’t miss concept and del Toro’s knack for adding deeper meaning to genre conventions while delivering some of the most wildly imaginative creature effects you’ll ever see. Everything about it is just…well…good…but not as good as it should be…or as good as I wished it could be. Noomi oh my! Don’t go in there! The trajectory of the Alien series has followed an eerily parallel path to my own life. Behold, both Alien and I were born into this world in 1979 with great fanfare…and we scared the bejesus out of all. We then went through a zany action-packed early childhood, with me waging wars with my GI Joe figures on my parents’ living room floor and James Cameron waging war on-screen with Aliens in 1986. 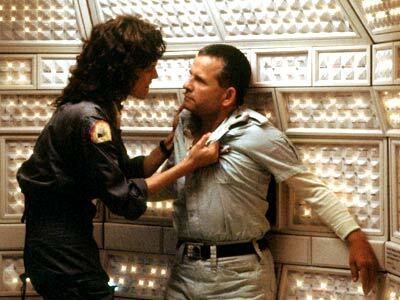 Then there were the awkward and painful teenage years that both I and the Alien series would rather forget. Cough cough Alien Cubed. Egads! Alien: Resurrection. Then there was the turn of the century where we both kinda sold-out and lost ourselves. Ugh…Alien vs. Predator! What were we thinking? But now past the age of 30 we both have grown introspective and retrospective, once again returning to the great mysteries of life and the age-old questions of where did we come from and why does our creator hate us? 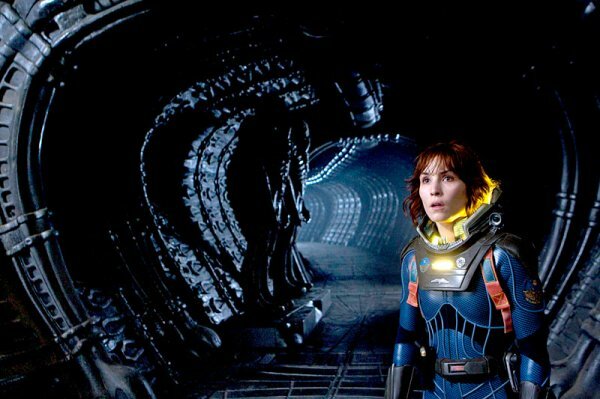 And thus, Ridley Scott comes full circle in his career and has bequeathed to us this ponderous and wickedly entertaining Prometheus. Inspired by the fan-boy raving over at Condemned Movies and in anticipation of the June release of Ridley Scott’s prequel/not-a-prequel hybrid Prometheus, I decided to take a stroll down memory lane and revisit Scott’s iconic Alien and Cameron’s raucous Aliens. What kind of damned robot are you? CAPTION: Lizzy Caplan and Jessica Lucas were ready for their close-ups until that pesky monster came along. At one point during the mayhem of “Cloverfield” our jerky-jokey cameraman Hud (an annoying T. J. Miller) remarks that the monster ravaging New York City is “something terrible.” Well, “Cloverfield” is pretty close to something terrible, but it’s also laugh-out-loud funny and loads of fun. Taking cues from “The Blair Witch Project”, “Godzilla”, and our current YouTube/MySpace crazed youth oriented culture that believes everyone’s point of view deserves to be recorded, producer J. J. Abrams’ opportunistic “Cloverfield” operates at a mercifully quick clip to maximize entertainment value with a minimum of effort (and budget) while showing us allegedly top-secret video footage recovered after a massive monster attack on NYC. Though barely ninety minutes long, we still have to suffer through an excruciatingly banal opening twenty minutes of vapid, spoiled twenty-somethings partying the night away before the monster strikes. There was a moment somewhere during this that I actually zoned out completely and found myself staring at the dark theater wall. The cast of unknowns thankfully contains a few people who might be able to act if given the chance in a normal film. Standouts include the painfully lovely Jessica Lucas as the feisty Lily and Zooey Deschanel look-a-like Lizzy Caplan as the sarcastic Marlena. These two young actresses acquitted themselves nicely while a group of anonymous and interchangeable actors playing stupid characters making bad decision after bad decision whirled around them. It made for one of those odd movie-going experiences where you actually start routing for certain characters to die in horrible ways while you hope the pretty girls make it out alive because, well, they’re cute. As a gimmick film, “Cloverfield” is as shallow as they come. It’s also too silly and too much fun to end up mad about it. At least the idiot hand-held cameraman/character wants to see the monster and the destruction as much as we do. This leads to some great money-shots of the creature and its tour of terror through midtown Manhattan. It would’ve been more thrilling had I not seen very similarly designed creature effects in last fall’s “The Mist”. Like that film, “Cloverfield” certainly has its moments of giddy monster oriented fun, but it ultimately implodes and leaves behind a wreck of a movie that is pretty close to something terrible. It’s official: Stephen King and Frank Darabont hate humanity. It’s almost impossible to fathom that these two were responsible for the life-affirming “Shawshank Redemption” when you consider their last two collaborations: the covertly vile and morally misguided “Green Mile” and now this bleak and hazy endeavor. Here they go back to King’s roots in this horror tale of a mysterious mist that falls on a small town and the group of people trapped in a grocery store who must survive the monsters lurking in the fog. Leading the cast are Thomas Jane as the artistic everyman (a stock King character), Laurie Holden as the pretty school teacher, and Nathan Gamble as Jane’s emotionally distraught little boy (another King archetype). Also along for the ride are Toby Jones as a spry and sensible grocery clerk, and Andre Braugher as an irate out-of-town lawyer. Darabont is a director of considerable skill, and it’s pretty amazing what he is able to do with a small budget in his depiction of some truly horrifying monsters and well orchestrated bouts of gore. He builds suspense, creates likable characters to root for, and crafts a fun, scary ride for the better portion of the film. Like in all the best horror films, the creatures are symbolic for modern society’s ills. Here the filmmakers explore the current “culture of fear” that has been created in the wake of 9/11 by politicians and religious zealots. Like most of King’s works, humans are even scarier than the creatures as seen in the character portrayed in great over-the-top style by Oscar winner Marcia Gay Harden. Her fire and brimstone preaching quickly divides those trapped in the grocery store down the lines of those who will be paralyzed by fear and turn to barbaric ways disguised as religion, and those who will do anything to fight for the right to survive. For the first one hour and forty-five minutes, the audience is treated to a well crafted, allegorical little monster flick, a throwback to those great creature features of the 1950’s. With less than ten minutes to the credits rolling, Darabont decides to bash his political message into the back of our skulls with all the subtlety of the blunt side of an ax. “The Mist” is impossible to talk about without talking about the ending. After keeping the nut-jobs at bay and effectively escaping the grocery story, five of the characters travel in relative safety inside a car to see how far the mist has conquered and if anyone else survived. With the mist still all enveloping, the car runs out of gas. Well, I don’t buy it. 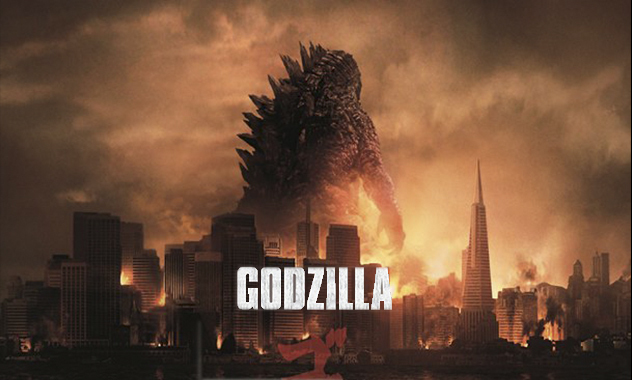 Next time, boys, don’t try to be so profound and just deliver us a good monster movie. We know you can you do it. You were so close here. You’re really good at writing horror stories, Stephen, and you’re an ace behind the camera, Frank, but sadly through “The Mist” your disdain for mankind shines brighter than your collective talents.